This professional is equipped with 9 years of experience offering local music lessons for children and adults. Lessons in your home can help you. This pro has received a number of positive guitar course reviews from satisfied customers. 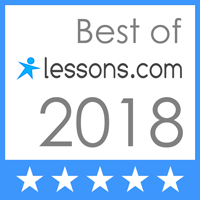 Choose Ryans Company if you are looking for passionate music teachers in Seattle. This pro offers guitar lessons for adults and kids. Check out their packages now. Choose Cappella Music Academy if you need quality beginners acoustic guitar lessons. They are available to enhance your guitar methods and guitar playing skills. This pro is willing to travel to your location. Get music lessons from the comfort of your home when you choose Riff By Riff Studios. This pro provides adults' and children's guitar lessons. She offers songwriting, percussion, drum, bass and guitar instructions, among others. Connie Wible offers bass guitar lessons at Mercer Island. This pro offers quality guitar teaching services to customers. Learn more about their guitar courses by visiting their profile. Greg Robinson provides local music lessons for students of various ages. This pro is among the private music teachers who offer guitar lessons at reasonable prices. This specialist also offers guitar lessons for kids and adults. Let music instructor Music Works Northwest help you discover your potential as a musician. Consider hiring Music Works Northwest. Their acoustic guitar teachers also provide music theory instruction. Let this talented professional help you in learning guitar. You might want to hire Alex. Alex Atwood also provides bass guitar lessons services. This group of pros will provide easy guitar lessons for beginners. This pro has been offering local music lessons for many years to students with ages 6 and above. In addition, this local expert can provide country guitar lessons in Mercer Island. Anshell Guitar & Bass Guitar Lessons is a provider of guitar lessons for advanced players. Their sessions include, rhythm, improvisation and composition. Howard provides quality and professional guitar lessons for all styles and levels. Check out some of the best guitar teachers of Music & Arts and become a good musician in a timely manner. Music & Arts is one of the firms that can provide professional guitar lessons for children. Let Ricky help you learn and create with music through their classical guitar instruction, bass lessons and more. Stan Williams is one of the songwriters and music instructors who specialize in various guitar playing techniques. This pro also teaches how to play mandolin and banjo. This pro provides basic and advanced guitar lessons and has 43 years of industry experience. Unleash your inner rock star with the help of Ari Joshua. This pro has been in teaching acoustic, bass and electric guitar lessons for 17 years now. This acoustic guitar teacher has 17 years of industry experience. These local music teachers have many years of experience in providing beginner and intermediate guitar lessons. This pro offers guitar tutorials with metal or classical guitar genres. Choose them and take advantage of their free 30-minute introductory session. This professional is one of the top music teachers who will provide music lessons. This pro offers guitar lessons among others. This tutor has been teaching guitar for many years now. Joshua Christensen provides guitar playing lessons in fun learning sessions. Joshua's music lessons will help you. Joshua offers guitar lessons to beginners and intermediate level players. As reliable guitar tutors, they offer fun guitar tutorials for kids and adults. This pro is a guitar teacher that offers private guitar lessons to students of all ages. This pro also teaches songwriting, music theory, and digital recording, to name a few. Learn how to play guitar and other musical instruments under the care of Chuck Buser Music. This professional can also teach pop, christian and blues. Ask for this pro's prices.